Last weekend’s Personhood Beyond the Human conference at Yale, reveals the growing support among ethicists, lawyers, scientists and others for changing the status of nonhuman animals from one of legal thinghood, with no rights, to a status of personhood with a capacity for legal rights. While nonhuman primates were the focus of the conference, reflecting the Nonhuman Rights Project’s lawsuits on behalf of chimpanzees, as a speaker I seized the opportunity to shine a light on chickens in my Sunday, Dec. 8 presentation, “The Provocative Elitism of ‘Personhood’ for Nonhuman Creatures in Animal Advocacy Parlance and Polemics.” A summary of my talk and others’ talks can be read here. 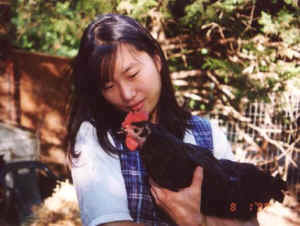 “Fred” grew into a lustrously beautiful black hen whom I renamed Freddaflower. Often we’d sit on the sofa together at night while I watched television or read. Even by herself, Freddaflower liked to perch on the arm of the sofa in front of the TV when it was on, suggesting she liked to be there because it was our special place. She ran up and down the stairs to the second floor as she pleased, and often I would find her in the guestroom standing prettily in front of the full-length mirror preening her feathers and observing herself. She appeared to be fully aware that it was she herself she was looking at in the mirror. I’d say to her, “Look, Freddaflower - that’s you! Look how pretty you are!” And she seemed already to know that. An article about the conference in The New York Times, “Considering the Humanity of Nonhumans,” Dec. 9, quotes another attorney on the Nonhuman Rights Project and the prospect of consideration of personhood in chickens or rats. The Nonhuman Rights Project’s vision is radical, and one that most legal observers consider unlikely to succeed in the near future. Jonathan Lovvorn, senior litigator at the Humane Society of the United States, says the Nonhuman Rights Project arguments are academically powerful but ‘just not feasible’ as a legal strategy. It’s simply too much to ask of a judge, especially at the trial level, said Lovvorn in WIRED’s in-depth analysis of the lawsuits. Judges might be reluctant to consider claims that might invite consideration of personhood in chickens or rats. They might just feel, in a primal, gut-level way, that legal rights are for humans. Imagine if such defeatist views had prevailed during the Civil Rights and Suffragist Movements in the 20th century and the Gay Rights Movement in the 21st. Fortunately, they did not.